This example was reproduced with 4Dv11.8 HF3. This requires 4D Server and 4D Client setup. I was unable to reproduce in a stand alone environment. 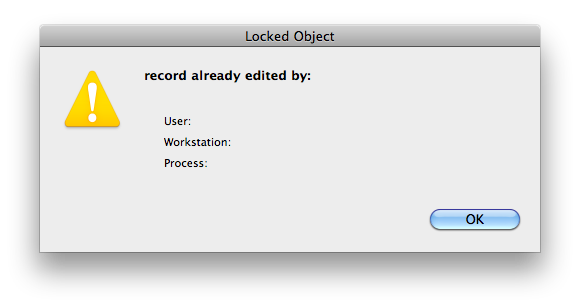 While working with SQL and 4D, sometimes records would show locked status of blank. LOCKED ATTRIBUTES returns -1 for the process in addition to the ‘blank’ user process and machine. Even though the documentation says this means you are trying to load a deleted record, this example has an existing record. There have been a couple of examples on the 4D tech mailing list regarding blank locked records. The locked record appeared to manifest from the SQL engine not ‘letting’ go of the record. In the following simplified example a SQL query updates a record in a table, which loads another record from another table in the trigger. If that record is not unloaded it remains ‘locked’. The only way I’ve found to unlock this record is to write a project method, make it available to SQL calls and load/unload this record. Regardless of how the ‘blank’ locked record manifest itself the IsRecordLocked should unlock it. $returnText:="Read only: "+String(Read only state($tablePointer->))+" Records: "+String(Records in selection($tablePointer->))+"\n"
Source code replicating this problem available upon request.